Sealing Screws | Electrical Sealing Screws | Cal Fasteners, Inc.
Cal Fasteners’ sealing screws are available in a range of standard sizes. Manufactured from durable, high quality steel with a corrosion-resistant zinc plating, they are designed to provide tamper-proof security. Holes drilled through the end of the shank or through the hex head allow a wire or cable to be threaded through. 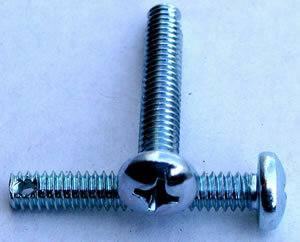 Our sealing screws are also available in stainless steel and select other materials upon request. Our sealing screws are often used in conjunction with our sealing wing nuts for maximum effectiveness. Request a quote on the sealing screws you need, or contact Cal Fasteners to learn more.